I’m sitting in the restaurant Morning Glory where I have literally just devoured a King’s feast. The restaurant is jam packed, with locals and tourists alike, chatting happily, clinking glasses, and sharing tender morsels of food piled high before them. This is one of four restaurants started by Trinh Diem Vy, a Vietnamese woman whose success in the local restaurant business is apparent. Each one is unique and caters towards different types of food. Morning glory, perhaps the most well known and popular, is famed for its street food menu and also for its cooking school. It offers old traditional Vietnamese recipes that most restaurants have long since stopped serving, combined with classic modern dishes. But back to my meal. Between two, we consumed a total of 6 courses; Shrimp mousse on Sugarcane skewers, Crispy pancakes with shrimp and pork, Beef salad, Sautéed pumpkin with garlic and spinach, Fresh spring rolls, and Papaya salad. It was one of the best meals of my life, the kind where you relish every dish that is laid in front of you and every morsel that enters your mouth. It was so exceptional I took pictures of each course, something that in general I tend to avoid. There is such a variety of restaurants in Hoi An to select from; in fact if you consult a Lonely Planet you will see that the list of activities is primarily composed of restaurants! It is seriously all you want to do here- eat eat and eat some more. It’s certainly what I’ve been doing here, taking supreme delight in choosing my three meals of the day (usually travelling limits you to two a day) in different establishments and trying different delectable dishes. My life has never been this food orientated before but it seems to be its only focus at the moment: fantasizing about my upcoming meal, grinning with delight at my current one, or fondly recalling my last one. I highly recommend Hoi An as a destination in Vietnam; it has been a truly glorious couple of days. We stayed for four nights and have done little else than explore, take pictures, walk the charming picturesque streets, and eat. We did also see a traditional art performance, which was highly enjoyable, and which I would recommend as well. But for me, it’s been all about the food. 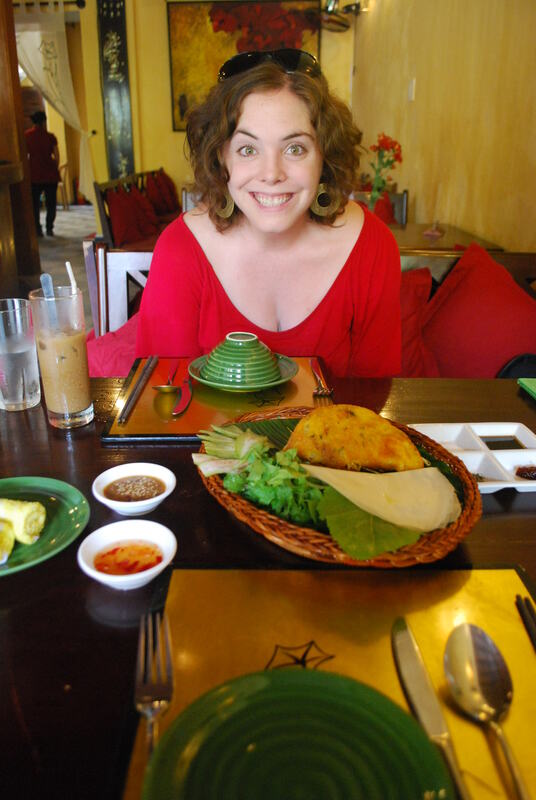 Morning Glory is definitely one of my top picks for restaurants in Hoi An but my personal favourite is Cafe 43. it is a charming, comfortable, family run restaurant, with excellent reviews and foreign recommendation letters posted all around the restaurant. 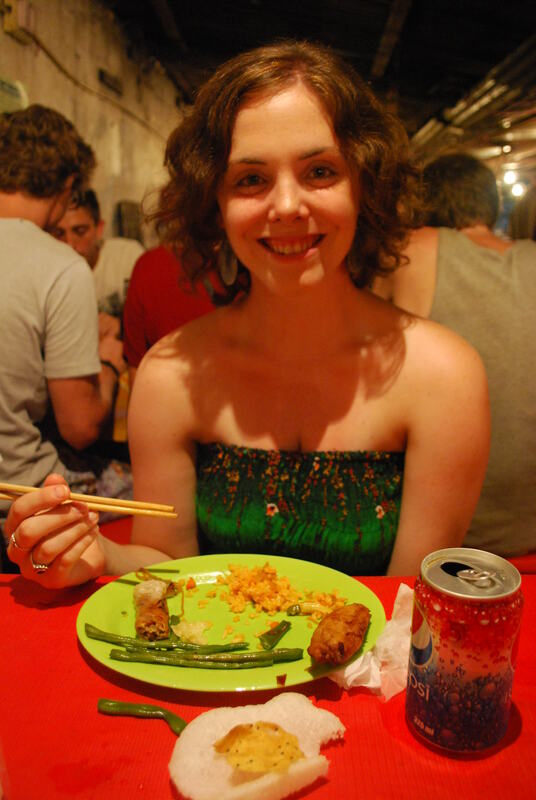 The food is incredible- delicous and cheap- and it is the perfect destination for backpackers as it also has the cheapest beer in the city! Order pho, get tofu fried in lemongrass and chili, try the stuffed squid, eat the red curry beef cooked in banana leaf and start it all off with fresh spring rolls. Those were all my favourite dishes and I’m seriously in love with all of them! Another thing that should be on the top of your list? A Cooking course! 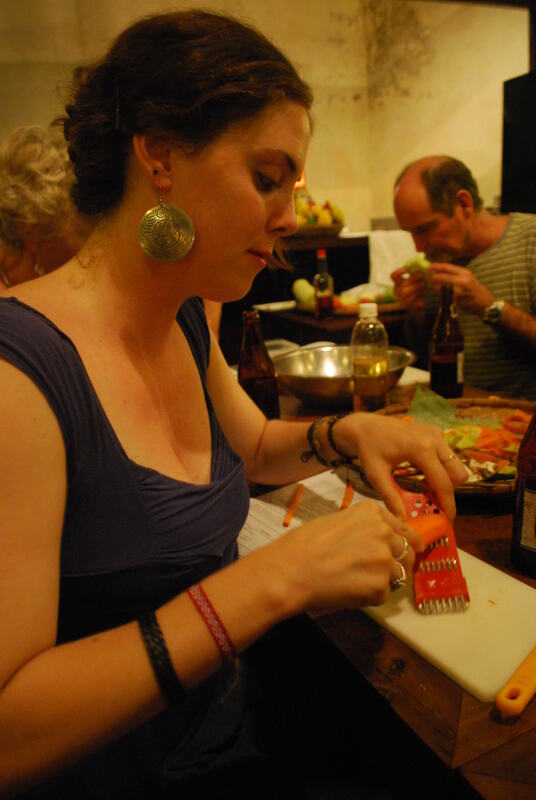 We did one with Red Bridge Cooking School, an evening course from 6-8pm, which includes cooking a three course meal, an extra two dishes that they cook and you just get to eat, recipes, and a free drink all for around the lovely price of $16! 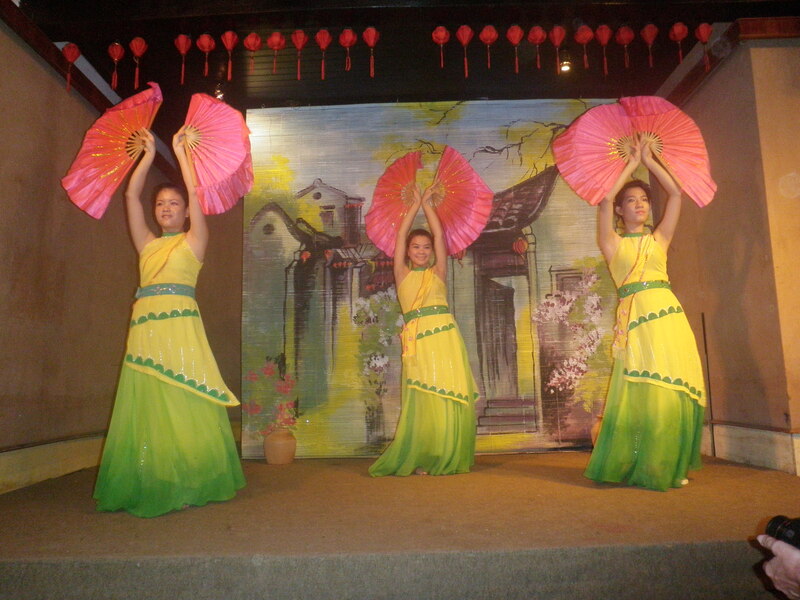 Entertaining and enjoyable, it was one of my favourite evenings in Vietnam. sounds so yummy I am jealous!!! Sounds delicious!! It’s making me hungry! haha maybe we can try cooking some vietnamese food together when im back!